Your place to find out all about worms, caterpillars, and other (not so) creepy crawlies. 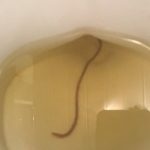 A reader recently reached out to us about a worm she found in her shower. 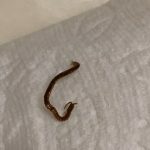 She said, “it looks like it has a lot of legs, which makes me think it’s a millipede, but they don’t live underwater and it was very much alive.” She is a little worried that it might be a parasite that came from one of her children while they were in the shower. We can say with confidence that we agree with our reader’s initial thought…this is a millipede! We recognize this as a millipede based on its round and segmented body, tiny legs, and two antennae. 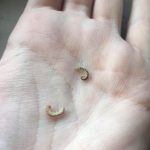 While we are pretty certain this is a millipede and therefore not a parasite, we encourage our reader to see a doctor if she is truly worried about her or her children’s health. Since we are not medical professionals, we aren’t licensed to give medical advice, so any parasite-related concerns will have to be addressed by a doctor! So, if millipedes can’t live underwater, what was one doing in our reader’s shower? Millipedes breathe through spiracles (tiny pore-like holes that line their bodies) and if they get too wet they can drown, but they can tolerate a wet environment to a certain extent…millipedes actually prefer a dark and damp environment! 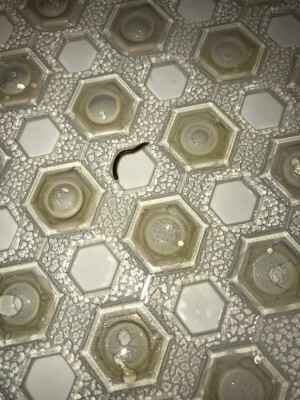 We don’t think the millipede our reader found is a full-time resident in her shower, just passing through! She can just remove the millipede from her shower and put it outside. There are a few things she can do to prevent future visits from millipedes. First, she can clean her bathroom to get rid of any debris that might be attracting millipedes and other small organisms. She can also investigate her house for any small gaps or cracks between doors, walls, windows, and ventilation systems. Sealing up these tiny entryways will prevent millipedes and other creatures from crawling in! Finally, she can install a dehumidifier to reduce the amount of moisture in her bathroom, which will make it less inviting to millipedes. In summary, we identified the brown organism our reader found in her shower as a millipede. These arthropods are considered to be harmless and are not parasitic as our reader feared. We identified the brown organism our reader found in her shower as a millipede. These arthropods are considered to be harmless and are not parasitic as our reader feared. You might also find these guys interesting! Submit a question! Then be sure to sign up below to get notified of new articles, which will include the answer to your question! Submit a Question *Please include where you are located, and a picture if you can! 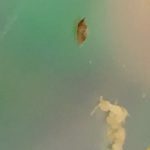 By submitting your question and/or a picture, you understand and agree that any picture and text you submit may be used by All About Worms without restriction. Please note that we cannot respond by email to questions. Questions will be answered on the site in the form of a new article. To be notified of new articles by email, please sign up below. 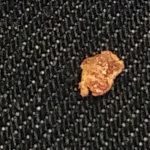 What is Tiny Brown Worm Found in Carpet? 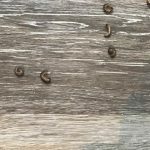 Are Tiny Worms Drain Fly Larvae? Is Worm The Cause of Child’s Sickness? 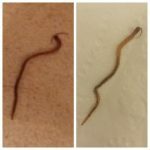 What are Segmented Worms With Hard Exoskeletons?